Wilson & Associates has the training, field experience, and understanding to provide for all environmental regulatory compliance needs. Environmental regulations protecting our nation’s natural resources are dynamic,complex, and often difficult to understand. From permitting and regulatory compliance, to biological surveys and construction monitoring, W&A has gained the respect of the regulatory community, working side-by-side with TDOT and TDEC, while taking into account each of our clients’ project specific needs. We understand the importance of building the project within the environmental guidelines and not making an environmental project out of a construction site. 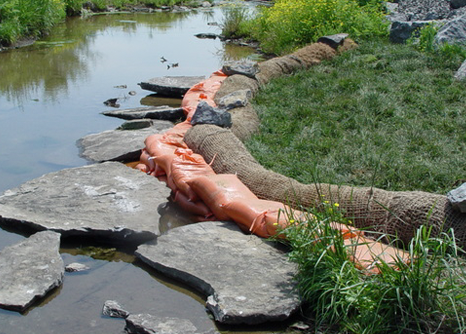 Our specialties include erosion inspection and obtaining environmental permits for waste and borrow. The Gap in Gallatin, Tennessee While W&A was providing the Contractor’s EPSC inspection services to minimize environmental impacts, a small amount of deposit started to seep under the large riprap designed to protect a stream. W&A proposed a timely and unique solution, using sandbags and stone, saving the Contractor time, money, and paper work.